Antony Hermus is Principal Guest Conductor of the Noord Nederlands Orkest and Artistic Advisor of the National Youth Orchestra of the Netherlands. He has an infectiously positive approach to music and life, and a natural talent for encouraging musicians to give their best. His dramatic flair, sense of line and shrewd approach have prompted engagements from the Philharmonia, Royal Concertgebouw, Rotterdam Philharmonic, Netherlands Radio Philharmonic, Bamberg Symphony, Danish Radio Symphony, Orchestre de la Suisse Romande, Melbourne Symphony and Seoul Philharmonic. He has conducted opera productions in Stuttgart, Strasbourg, Gothenburg, at the Komische Oper Berlin, Opera North and Nederlandse Reisopera. 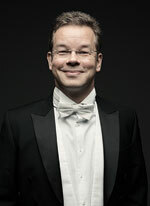 He began his career as Music Director in Hagen before moving to Dessau, where he conducted his first ‘Ring’ cycle. His orchestral repertoire focuses on the great Romantic symphonies and twentieth-century masterworks, but he also excels in contemporary music, having conducted in the Philharmonia’s Music of Today series, led the Norrköping Symphony Orchestra at the Swedish Composer Festival, and conducted the MDR Symphony at the IMPULS festival. In 2017 Antony recorded Alphons Diepenbrock’s tone poems with the Bamberg Symphony following their recording of works by Siegmund von Hausegger. His discography includes works by Wagenaar, Klughardt, and Auber’s La muette de Portici. While in Hagen he recorded Mahler’s first symphony and a symphonic version of Tristan und Isolde.